LIBERTY, S.C.–Cornell Dubilier Electronics, Inc. (CDE) recently announced what it considers a significant new development in aluminum electrolytic technology. Cornell Dubilier's new THA and THAS Series Thinpack capacitors are low-profile aluminum electrolytic capacitors that offer "the highest energy density available in low-profile aluminum electrolytic technology," the company said in a press release. At only 8.2mm thick and 9mm thick, respectively, the 85°C THA Series and 105 °C THAS Series Thinpack capacitors are comparable in height to V-chip electrolytics, tantalums, and board-mounted axials. However, they are said to offer much higher bulk-storage energy density. A single THA/THAS capacitor can replace an array of SMT, axial, or radial aluminum electrolytic or solid tantalum capacitance arrays, a substitution that enables engineers to design smaller products with simplified assembly and higher reliability. The THA/THAS Series design is said to be radically new, yet based on CDE's more than 20 years of experience with MIL-grade flat electrolytics. Reengineered to be thinner and more cost effective, the capacitors are a good fit for many of today's high-performance electronics, according to Cornell Dubilier. Unlike traditional cylindrical electrolytics, a THA/THAS capacitor has a sealed, laser welded aluminum case that eliminates the need for space wasting end seal gaskets. The design includes a valve to vent hydrogen gas, reducing swelling by relieving internal pressure. For most applications, the THA and THAS Series Thinpack capacitors are said to offer significant cost, weight, and space savings versus a comparably rated bank of SMT or axial aluminum electrolytic capacitors. This includes requiring about 70 percent less board space than alternatives, resulting in reduced overall size and weight of the finished board. The use of a single component versus many, as well as fewer connections, improves overall circuit reliability. The THA is rated at 3,000 hr. life &commat; 85 °C; and the THAS is rated at 3,000 hr. life @ 105 °C. 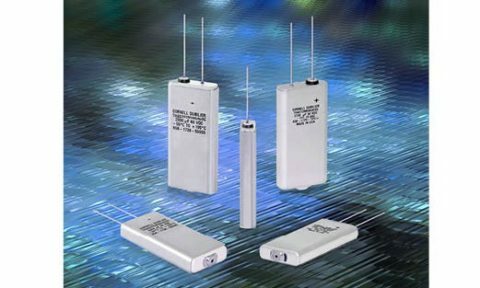 Potential applications include any circuits that require high capacitance bulk storage and filtering in a low-height profile. These include tablets, laptops, instrumentation, commercial-grade LED driver modules, and compact power supplies, as well as drones, RPVs, set-top boxes, 1U rack-mounted devices, and other thin, high-;performance devices. Cornell Dubilier (www.cde.com) provides components for a number of end markets, including inverters, wind and solar power, electric vehicles, power supplies, motor drives, HVAC, motors, welding, aerospace, telecom, medical equipment, and UPS systems. The company has ISO-9001 certified North American manufacturing and distribution facilities in Liberty, South Carolina; New Bedford, Massachusetts; and Mexicali, Mexico.